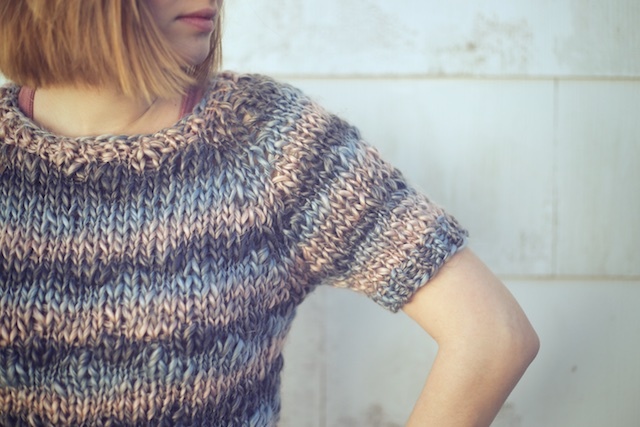 The Kingston Sweater is another test knit from 2015. 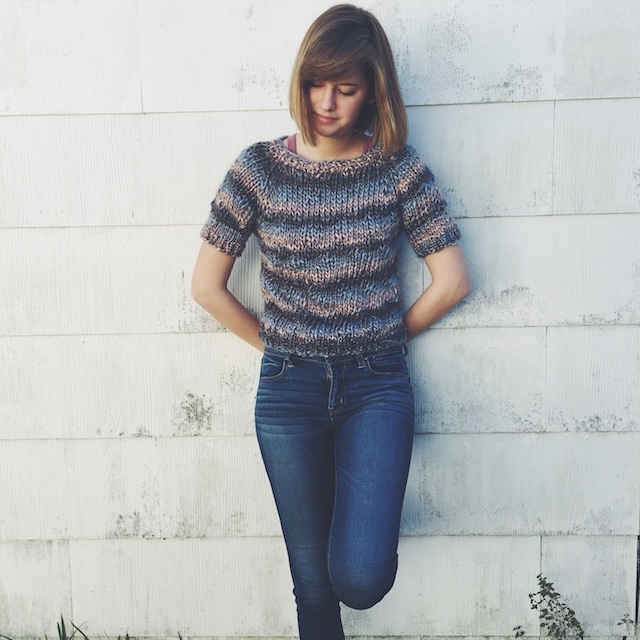 I can't recommend this pattern enough if you want a chill weekend sweater project. I loved knitting it. I will absolutely be making another with longer sleeves and solid yarn soon. I had time to order yarn for this test knit, but when I received it, it wasn't as bulky as I'd hoped. I'd already planned to hold it double, but that still didn't make a dense enough fabric. To fix this I added 5 stitches to both front and back and 2 stitches to each arm. I don't like mucking with the numbers of a test knit, but I'd already made a cardigan version of this, so I knew the y would work out as written. I was also trying to crank these knits out for the designer and didn't want to wait on another yarn order. That is my one regret about three of my test knits- I wasn't pleased with my yarn choice. I feel like they deserved better yarn than I had on hand. Oh well, that gives me something to look forward to making in the future. The details: I used size US 10 needles for the ribbed neckline and moved to size US 15's for the body. The pattern is very adaptable, allowing for more or less raglan increases depending on your size, so I did a few extra to compensate for the thinner yarn. About this Sylvan yarn- I thought this was a softly variegated yarn when I purchased it, but it is a bit more striking in person. It also stripes. After swatching with two strands held together, at different points in the color changes, I felt that I couldn't get an even variegated look. So, I held my strands together at the same points in the color pattern and let the sweater be striped. This required shorter sleeves as all of the skeins were different. It's not what I intended but I don't think it looks bad. Will I buy this yarn again? No. 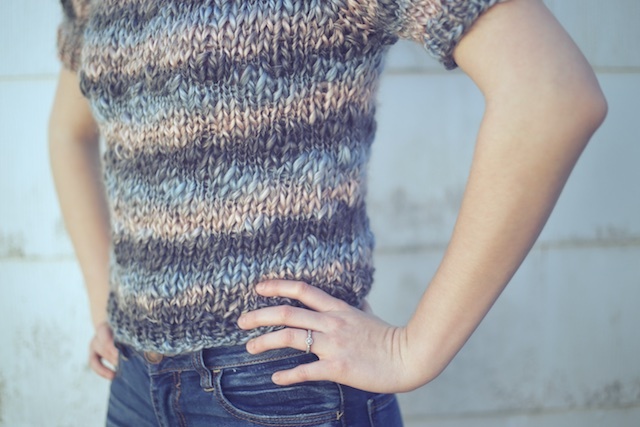 It's not my favorite look for thick and thin yarn, but it did have a good texture. If they made it in a solid color, I would've stockpiled it. This is on the smaller side, so I gave it to my daughter, who wore it for these photos. 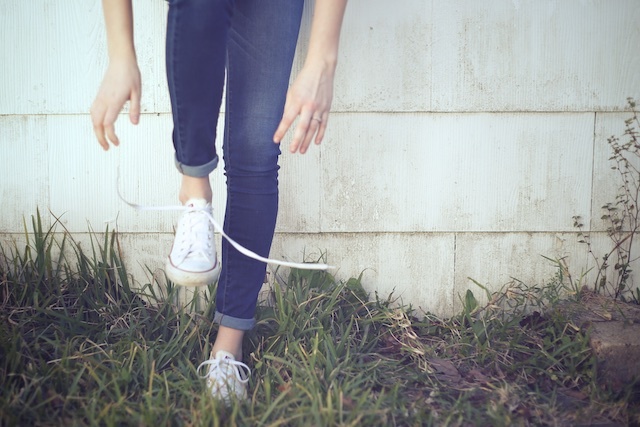 It's wonderfully soft and very comfortable. 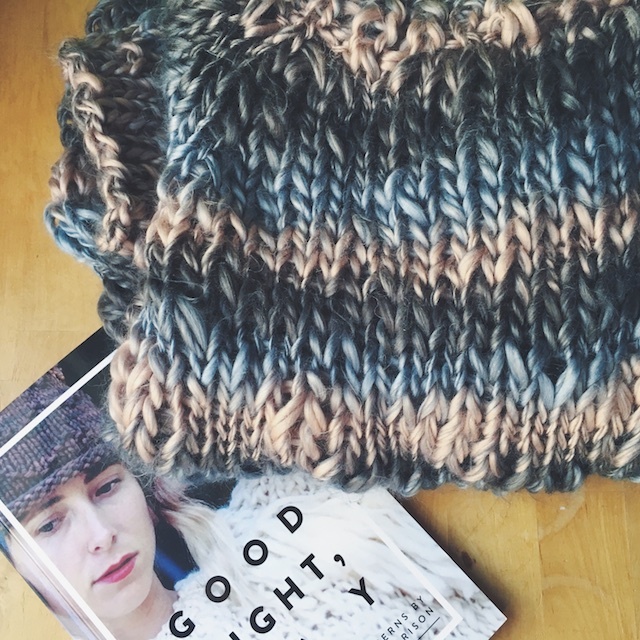 You can find this pattern and more in Tara-Lynn Morrison's Good Night, Day knitting pattern book. Though I've knit everything in it, I've ordered some super bulky yarn to knit myself a Kingston. I have a couple of really nice recycled skeins for my own Innisfil Tank. In the stash, there's a skein ready for another Omemee Toque, two contrasting colors for another color-blocked Jarvis Fisherman Toque, and a second Leeds Halter Top already in the works. You can see I'll be going back to this pattern book again and again. What's your perfect weekend look like, knitting-wise?